Choose the closest size from the charts. I always endeavour to take the clearest possible photograph, but colours and shades can vary slightly between photos and the actual item. These are beautifully crafted rings that have a substantial layer of gold chemically or heat sealed to a strong base. This ring has a brilliant blue sapphire Austrian Crystal surrounded by many white diamond Austrian Crystals. In the photos you can see how brilliant this is, in the last one I have shown a torchlight through it from the back to let you see the amazing blue sapphire Crystal colour. These are beautifully crafted rings that have a substantial layer of gold chemically or heat sealed to a strong base. They are gold plated/gold filled but are made in the orient so have no UK hall marks, hence the amazing bargain price. It has all the great characteristics of solid gold jewellery. Do not compare gold filled jewellery to plated jewellery as there is no comparison. Stunning 2.43ct Morganite Ring Size L 1/2. This is a stunning looking ring guaranteed a comment! A beautiful Morganite (simulated) stone is set in the centre of the ring, surrounded by pink gem stones and white crystals. Stunning, different and beautiful!! The ring is yellow gold filled. The ring size is L 1/2. Please buy correct size as not resizable. 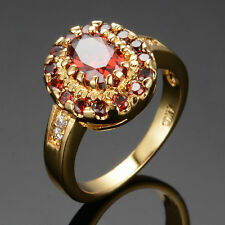 Comes in beautiful velvet ring box. It has all the great characteristics of solid gold jewellery. Do not compare gold filled jewellery to plated jewellery as there is no comparison. We can assure you that we will resolve all the issue right away. Yellow Gold Filled Oval Cut Amythest Purple Cubic Zirconia. 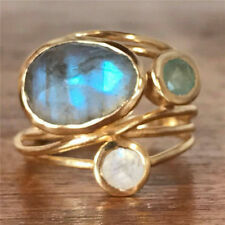 These are beautifully crafted rings that have a substantial layer of gold chemically or heat sealed to a strong base. They are gold plated/gold filled but are made in the orient so have no UK hall marks, hence the amazing bargain price. Main Colour Clear Brand Unbranded UPC Does not apply UPC Does not apply EAN Does not apply.